I am so happy to be back for Sewvivor this week with some selfish sewing! 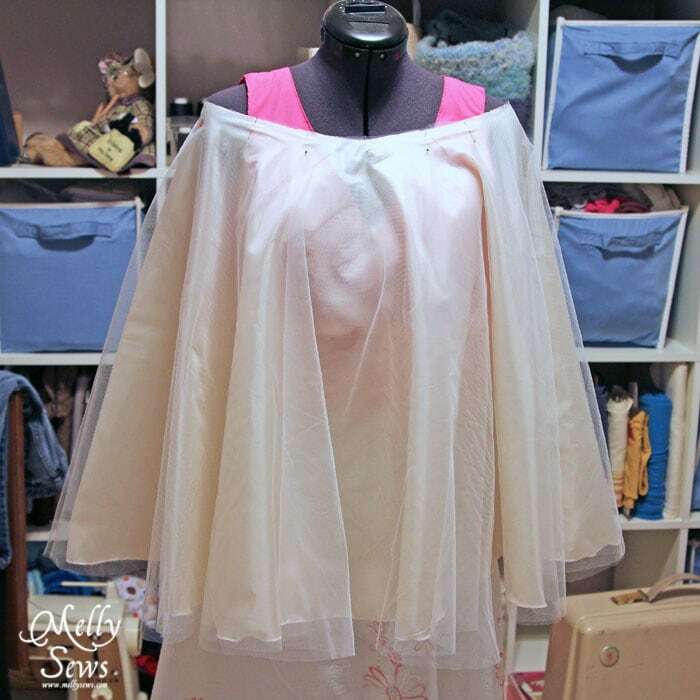 I made three pieces this week – a t-shirt, a blazer, and a tulle skirt (tutorial below). When I found out I would be competing, I immediately headed to the fabric store to find some buttons. I’m pretty practical about buttons – I get functional ones when I need them and don’t really have a button stash. Luckily for me buttons were half off because I got inspired by these blingy bejeweled and vintage looking buttons, which were also quite pricey for my three pieces. I sewed the buttons all over my Rose T-shirt pattern as decoration, using transparent thread so as not to take away from the bling. The t-shirt itself is 100% bamboo knit that I hand dyed, and it is sooooo soft. The blazer is the showpiece, and where I spent most of my time. I drafted the pattern based on a green velvet blazer I’ve owned and loved for years. It took forever and reminded me of why I never want to compete on Project Runway – I would never get done in time for the runway. The fabric is also hand dyed by me; I’ve been hoarding some off-white cotton velvet for a while for this purpose. The jacket is fully lined and features a single button front, rounded patch pockets, vintage inspired non-functional buttons on the cuffs, back vent and a notched collar. AND – I’m planning a blazer sew along next week with a free version of this pattern for those on my newsletter list. I decided that instead of modeling these pieces with some dyed skinny jeans, I would make the tulle skirt I’ve been wanting to do. But instead of doing elastic or a zipper, in keeping with the theme I decided to do a button closure for the skirt. 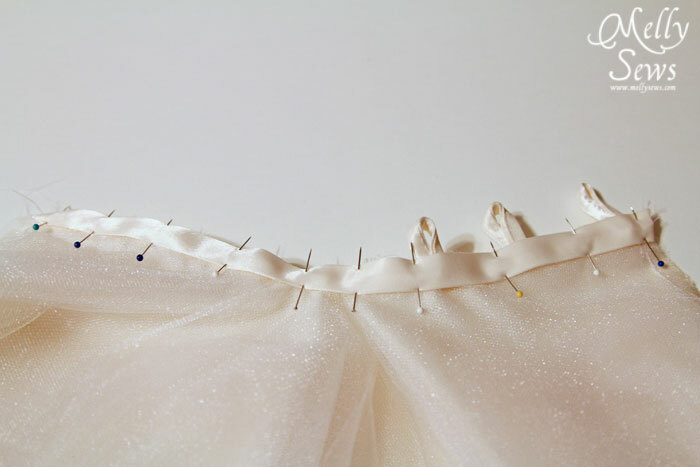 Read on to see the tulle skirt tutorial. 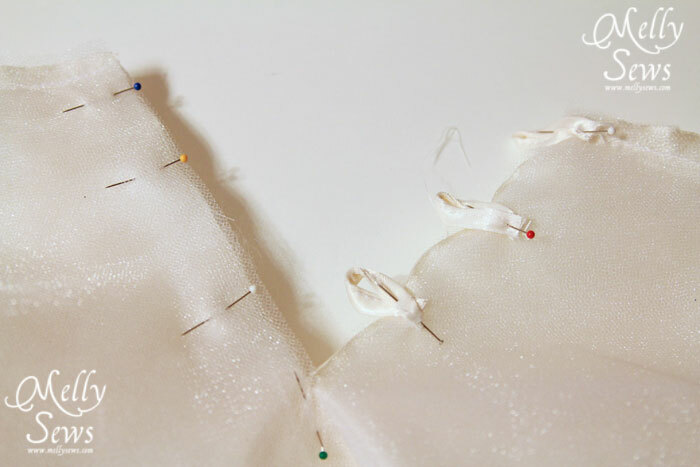 To start, I cut out 9 circles – 1 of lining fabric, 4 of creme tulle, 2 of white tulle and 2 of sparkle creme tulle. I went for the different colors to add depth to the skirt – it’s subtle, but you can see it in person. 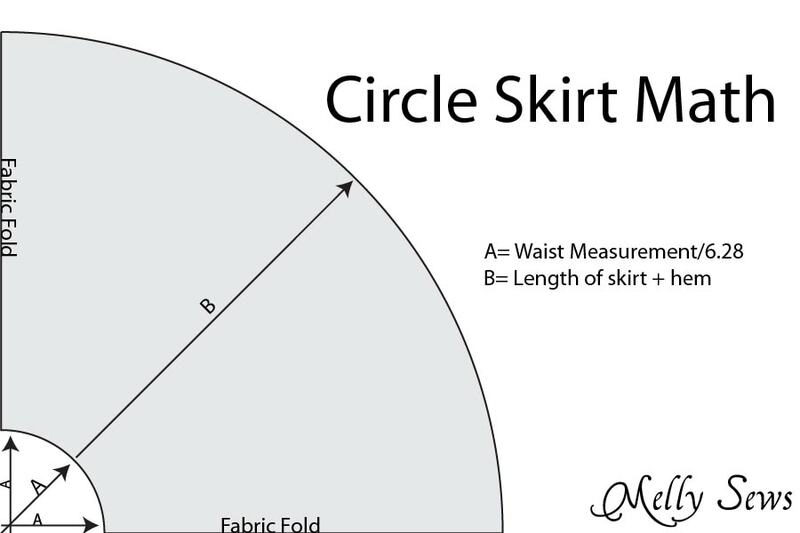 Circle math – follow the diagram below if you’ve never made a circle skirt. Next I did a rolled edge hem on my lining circle, so I wouldn’t have to worry about hemming it with layers of tulle to move out of the way. The tulle is unhemmed. 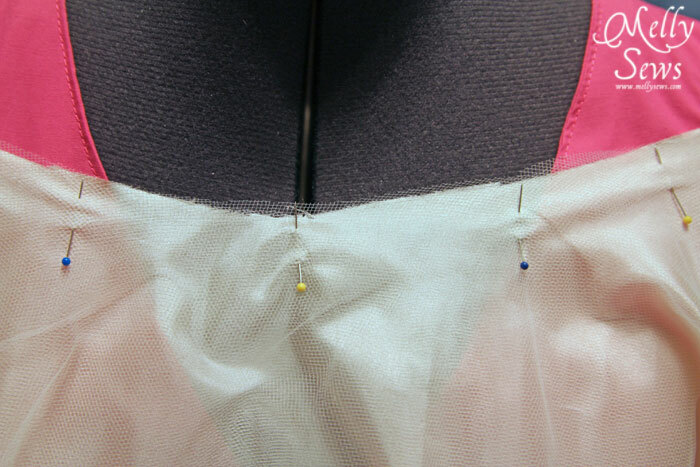 Since I was working with so many layers and tulle can be fussy, I found it easiest to drape the circles around Molly’ the Mannequin’s shoulders and pin one layer at a time into place. Tedious, but it worked. I counted the layers each time I repinned to make sure I was catching all the tulle at the waist. Once the waist was pinned, I basted it so the tulle wouldn’t escape as I worked, then I cut a slit into one side through all the layers for the button closure. More pins. I used satin ribbon to make both 1/2″ and 1″ bias tape. Tip: spray starch kept the satin from unfolding after I ironed it with my bias tip. I made tiny bias tape button loops (fold 1/2″ single bias tape in half and sew shut) and pinned those onto my skirt. Elastic cord would also work, but I didn’t have any on hand and the satin just looks prettier, I think. I basted the loops in place, then I pinned 1/2″ bias tape on both sides of the slit, sandwiching the loops and edges in between. 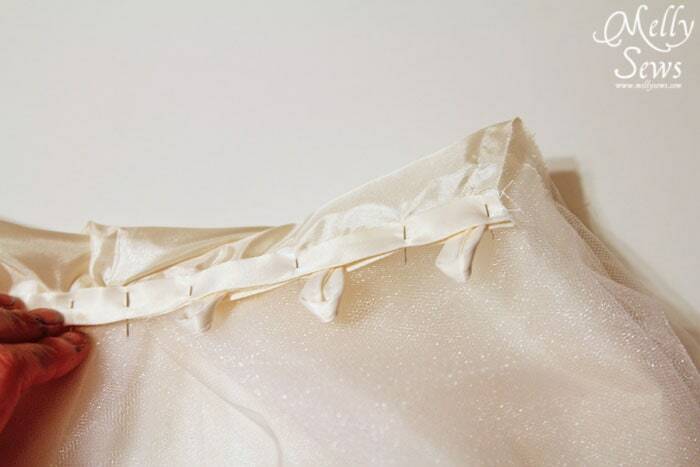 Sew down both edges of the tape, then fold the bottom and stitch across so it lies flat – like a sleeve placket. After that, I used the 1″ single fold bias tape to bind the waist. 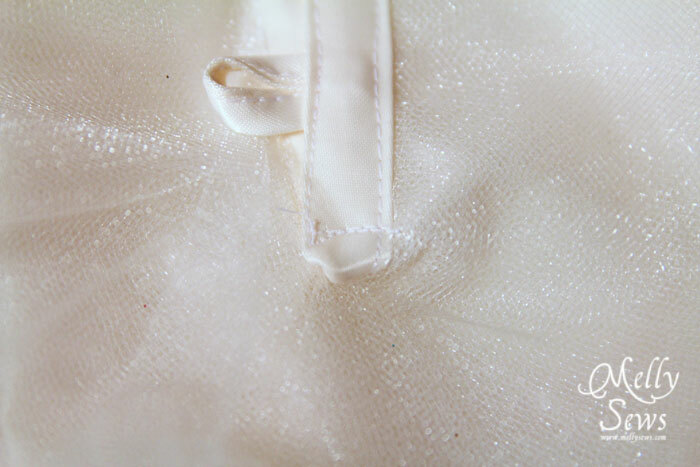 Then I sewed on the covered buttons (more satin ribbon) and I was done. And Hubby may have convinced me to give twirling a try for photos, and this skirt does twirl beautifully, but on an empty but for coffee stomach on Easter morning it also reminded me why I quit ballet – twirling and my head don’t agree. But hey, a grown up women can twirl in the park in a poufy skirt if she wants to, right? The guy with his metal detector didn’t even look up. Oh Melly you look beautiful!!! This is such a gorgeous outfit!! Absolutely gorgeous! Great job, heading over to vote. The colors are gorgeous and the textures, too. How wonderful that you sewed this ~ you have such range with your sewing skills! I look forward to seeing what you create for the quilted challenge. Such a nice outfit, thanks for the tut! My daughter just said I must have that skirt so it looks like I will have to make one in both our sizes!! This outfit is AMAZING! The shirt is making me want to purchase this pattern next, I am a blazer JUNKIE so hopefully I will be along for the sew along if I can get some fabric and this tulle skirt is LOVELY to say the least–that button closure with the satin is SO so pretty–no WAY you would be voted out this week! Simply beautiful! I love it all, especially the skirt. Oh, how pretty! I love that you made a tulle skirt look so sophisticated! And the jacket is gorgeous! Your sewing is amazing:) this is wow!! Love your projects!!! Selfish sewing rocks! You look great! Lovely outfit and photos–the whole vibe is great! So lovely! All the pieces are great but I especially love the grown up version of a twirly tulle skirt! I love this skirt, and the t shirt, they’re gorgeous! gorgeous, all of it! I love the tulle skirt! This is gorgeous! I love the dyed bamboo knit. It’s the perfect color purple. And I look forward to seeing the blazer sew along! Ooooh, pretty skirt! I like that this is a grown-up version of the lovely skirts the little girls get to wear. 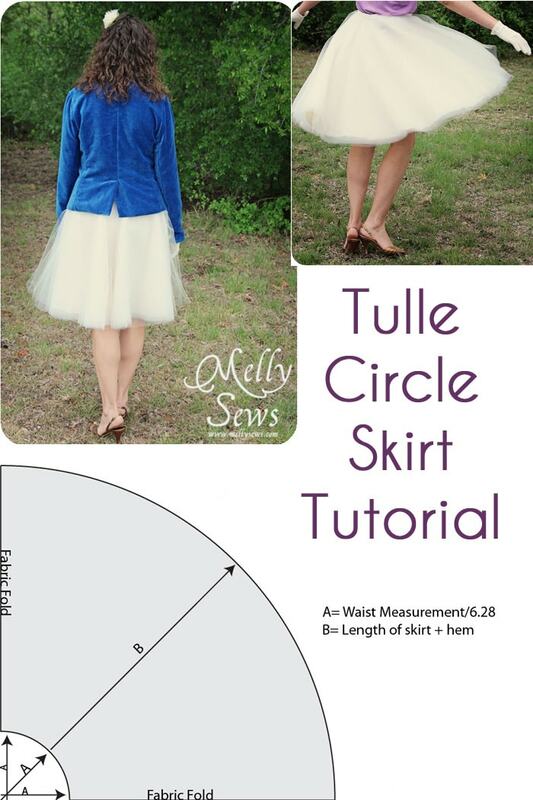 Maybe this is a silly question–but it tulle really wide enough that you could make a circle skirt without having to piece anything? Using a circle skirt silhouette makes it so much more flattering than a gathered waist. Truly a beautiful outcome. I just had to tell you that you look so cute and feminine in this beautiful outfit!!! I love it! And I WILL definitely try this skirt tutorial on my own! 🙂 Newest follower here from a link party tonight! Congratulations Melissa on advancing to the quilting round!! I TOLD YOU!! LOL!! Great job! I just know you have something awesome in store for next week! I haven’t sewn in many years. I used to be fairly competent. What happened? I tried making a tulle skirt before I visited your site. I was making it from a picture of a skirt similar to yours, but there was no tutorial. 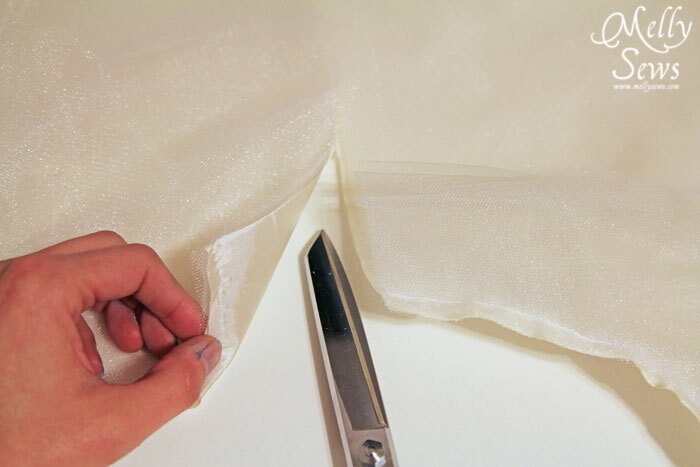 The width of the fabric was approx 2x’s the length I needed so I cut the tulle in half and cut 8 rectangular panels. I had to gather and baste. I then sewed on the wide gold elastic waisteband and a vintage slip as a liner.